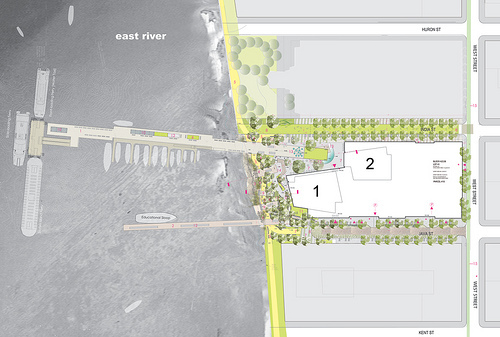 Stiles Properties’ proposed Java Street (bottom) and India Street piers, as seen in a 2009 rendering. Last month, the City’s Economic Development Corporation issued an RFP for the redevelopment of the Java Street pier. This is the only City-owned pier on the North Brooklyn waterfront (it’s actually a pier in concept only – the actual pier structure was demolished in 2000). EDC’s current call for proposals seeks to carry out that mission, by transferring ownership of the . aims to identify and select a qualified and experienced developer that has the financial capacity to construct improvements on the Site, including a new pier structure that will allow for vessel moorage and provide local residents with safe and enjoyable access to the East River waterfront. Public access to the waterfront is sorely lacking in Greenpoint*, so any progress on this front is a big step forward. But according to Councilman Steve Levin’s office, this may all be part of a deal between EDC and the developer of an adjacent waterfront site, Stiles Properties. According to Levin, Stiles and EDC have already applied to the Army Corps of Engineers to start the construction of the pier. So what’s in it for Stiles? Three words – FAR. Even though this property is in the middle of the East River, it is still a “parcel of land”, and it comes complete with development rights, zoning restrictions, etc. Stiles owns the adjacent property between Java and India Streets, west of West Street. With its R8 zoning, the ±18,000 square feet of (underwater) land would generate up to 40,000 square feet of additional development rights by Levin’s calculations. Those development can only be transferred to adjacent properties (like the one which is owned by Stiles Properties). Is this a bad thing? That’s not entirely clear. Greenpoint needs access to the waterfront, and an innovative public/private partnership may be what is needed to kickstart a very moribund development environment on the Greenpoint waterfront. Certainly the City isn’t in a position to build out the pier and provide the public amenity. So this may be the best way for the City to follow through on its promises from six years ago, and for the Greenppoint community to start to reclaim its waterfront. But as an adjacent property owner, Stiles is in a unique position to capitalize on the development rights here (as is the owner of the block to the south, who – by the way – claims that he owns part of the site that the City is trying to transfer). Stiles presented plans for a Java Street pier to Community Board 1 almost a year ago. The fact that Stiles has already applied to construct a pier on Java Street indicates that they have some expectation of winning the RFP. The RFP itself is very aggressive in its timeline – it has a one-month turnaround (sorry – the deadline already passed), and requires that applicants demonstrate that they are “prepared to commence construction within six (6) months of closing and complete construction within eighteen (18) months of commencement”. And with the work their architects (Pelli Clark Pelli) have been doing over the past couple of years, Stiles has a clear advantage in the requirement to submit architectural plans on short notice. The RFP raises other questions. It says that the use of site must “serve a public purpose”, but what are the requirements for public access? Would it be transferred to City Parks as other waterfront esplanades and piers are required to be? Would it be open to the public at all hours, or would it be treated differently? Will the additional floor are generated come with a requirement to build 20% affordable housing, or is it all market rate? In the end, a lot of the concern is about transparency. Greenpointers were upset when the Palin development on the block to the north (India/Huron) went up to 40 stories by moving existing bulk within the same property (no additional FAR was generated in that move). But that was done with a public review. This proposal would increase the as-of-right development by 6% or more – from 660,000 sf to approximately 700,000 sf, all without public input on the design and use of City-owned property or any public review at all. * No private developments have broken ground in Greenpoint, so the waterfront esplanades that you see going in at Northside Piers and the Edge are far off in Greenpoint’s future. The City recently broke ground at Transmitter Park (expected to be completed for Summer, 2012), and has constructed a small park at the head of Manhattan Avenue. Larger open-space projects in Greenpoint are on hold – 65 Commercial Street is stuck in MTA limbo, Barge Park is awaiting the demolition of the Sludge Tank and Bushwick Inlet Park is waiting on the City to take action to acquire a series of (environmentally suspect) private sites. Oh I love all of these! Especially because they are so simple and beautiful yet have a cool edge. And I love the idea of adding a studded accessory to a feminine outfit- I think I will try that soon!